You could be a model. I don’t even know if this can qualify as a backhanded compliment, as I have yet to see where the “compliment” part is. I guess she’s tall? Ugh. How many shades of this man are we going to see on this website? 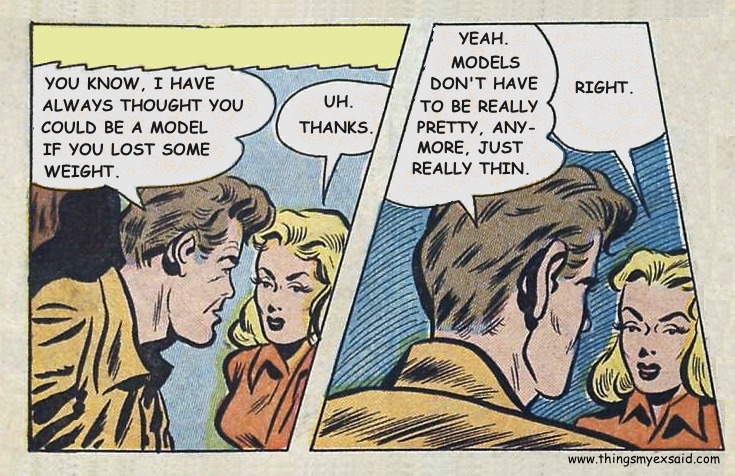 Men, can you get it through your heads that alluding to someone being too fat is just not okay? Yes, even if you are a doctor. Save it for the clinic. You leave me to imagine that you think I’m pretty, and I’ll leave you to imagine it’s okay to have two chocolate croissants for breakfast. And we’ll both die of the American Condition early, but happy. Or, you know, keep picking on your loved one’s nose and thighs and feet and upper arms. What do I know? I’m just a voice on the internet. Speaking of voice, rehearsals for Things My Ex Said: The Cabaret are going great!!! I’m so excited and I just can’t hide it! Performing on Monday, 12 May and Friday, 16 May at 7:30 PM at the Grand Ballroom in Sloan’s, Glasgow. Come see your favorite quotes brought to life against a backdrop of badass 90’s tunes. Tickets on sale now! Oh my goodness, this reminds me of all the completely bogus ideas in that book The Game. Ugh. Unfortunately I have a husband who alludes to my weight on a constant basis! Great post, thanks for sharing! wow, i really thought most men were evolved enough to know not to say that stuff out loud! silly me. By the way everyone, this was me. And I am 6’1″. And I was a size 6 at the time. For real.